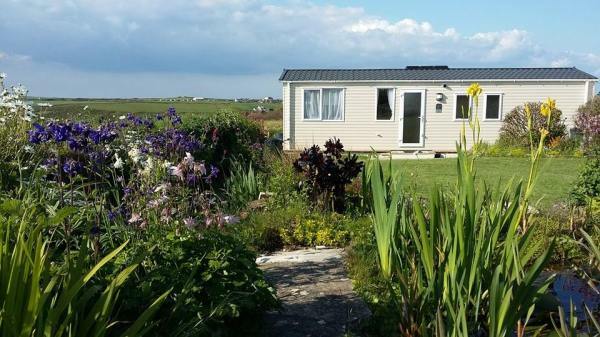 We have lived at Golden Burn Cottage for many years and over that time have striven to make the garden in which the caravan is situated as wildlife and wild flower friendly as possible. We have 2 large ponds that have a large population of frogs, newts and fish. We do ask that our guests, particularly those with young children do take care around them. The garden's exposed rural position close to the coast can mean the caravan is subject to the full force of the North Atlantic gales but the vista provides stunning sunsets, tranquility and opportunities to see barn owl, peregrine falcon and buzzard throughout the year. In winter kestrels, merlin and the occasional hen harrier can be seen hunting the stubble and set-aside fields. Immediately surrounding the garden is a population of corn bunting that the RSPB is monitoring. At sea, along with the resident gulls, gannets, auks and shearwater feed and pass close to nearby Park Head. There is a badger set less than 300m from the caravan and a small population of roe dear living in the cereal field between the garden and cliffs. Our parish of St Eval has very little light polution so on cloudless moonless evenings we enjoy spectacular veiws of the Milky Way and the stars. The caravan is situated less than 500m from Porthcothan Bay. Mosts guests elect to leave their car on the driveway and walk down to the beach along the road although there is a council car park adjacent to the beach. The beaches of Treyarnon, Constantine, Bedruthan, Diggory's and Mawgan Porth are each within 3 miles of the caravan.